I found some interesting reading recently in a 1940 Overton County Fair Book loaned to me by Mr. Buck Ward of Livingston. 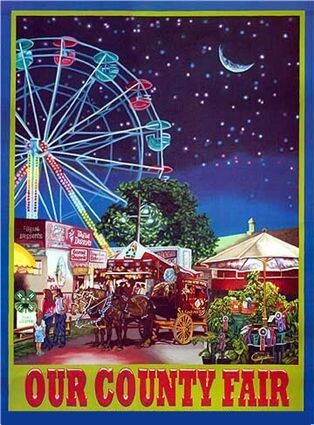 That year, the fair was held on Thursday, Friday, and Saturday, September 26-29, 1940. Mr. Albert B. Smith was President, Tracy McCormick, Vice-President, and Hassell B. Smith was Secretary-Treasurer. William O. Sewell was the county agent at that time. The various departments included livestock; field crops; horticulture; poultry; community exhibits; home section; education; health; and athletics. Many departments awarded .50 cents for first place and .25 cents for second place. Some departments had $1.00 for first place and .50 cents for second place. The name of one department of the 1940's fair that I believe would not only raise some eyebrows today, but more than likely would include a good flogging for whoever gave it that title, was called "Old Ladies Section" - "For Women over Sixty Years of Age." Some of the categories listed were "Best Apron" "Best Knitted or Crocheted Shawl" and "Best Afghan." Reading these categories would lead a person to believe all women over the age of 60 had to do was sit in a rocking chair and knit. Surely there were some of the ladies who took offense concerning the choice of the name for this department. And what about those women who were included as directors of the fair that year? Evidently they didn’t question what today could only be interpreted as insulting and misleading about women. The names of those women serving as fair directors in 1940 were Mrs. Louise Thedford; Miss Lourine Forrester; Mrs. Benton Cantrell; Mrs. J.D. Mitchell; Miss Margarett Taylor; Miss Roxie Ledbetter; and Mrs. E.A. Qualls. The remaining 10 members of the directors were men which brings that old saying to my mind ... "What’s fair for the goose is fair for the gander." And with that being said, I did not find any mention of an "Old Men’s Section" in that particular fair book either. Can you imagine what an uproar there would be if a category was included with the name "Old Ladies Section" in a fair held today? And rightly so, I might add! Overton County Teachers Association; Union Bank & Trust Co.; Gate City Mill; Speck Funeral Home; Benson Service Station; Kuykendall Shoe Shop; T.P. McCormick; Maynord Beauty Shop; Alex Smith; Bush's Radio Shop; Cumberland Freight Lines; B & O Drug Co.; Smith & Holman; Jenkins & Darwins; McDonalds Grocery; Rose's Café; Alvin Vaughn; Roy Eubanks Service Station; Lansden & Coward Drug Co.; Taylor & Holman; The Economy Store; Ritz Theater; Ray's; Speck Bros. Hardware; Bussell's Grocery; Fleming & Myers; Cash Feed Store; Patterson & Roberts Hardware; E.B. Gray, Jeweler; Dr. W.M. Brown; 7 Up Bottling Co.; Bilbrey Chevrolet Co.; McCormick Motor Co.; S.B. Smith; Medlock Lumber Co.; Wisner's Service Station; Mrs. Luther Myers; H.B. Nevins; Arlice Hodges; Dr.C.H. Dowell; Elise Qualls; H.M. Harris; D.F. Poston; Shirley McCormick; O.T. Huddleston; H.C. Swallows; M.A. Allen; Floyd Davis; J.Y. Spicer; B.C. Clark; B.R. Estes; Dr. A.B. Qualls; Needham's Bargain Store; Poindexter Grocery; Triangle Service Station; W.C. Martin Furniture Co.; Variety Store; Livingston Dry Good Store; Ben Daily & Sons Produce; Winningham Tire Co.; Maple Shade Service Station; White Shoe Shop; Sid's Radio Shop; Bradford's Shop Shop; Elizabeth Huddleston; Mayver Moore; Tommye Huddleston; James E. Butler; H.B. Smith; A.B. Smith; Stanley H. Carr; Hearly Tucker; Cleston Grimsley; Emogene Cooper; Phelia Halsell; William O. Sewell; P.C. Holt; S.S. Copeland; Grant Smith; Walter Thompson; John Thompson; C.C. Gore; Carl Stockton; Walter Claborn; Coca Cola Bottling Co.; W.R. Shell; H. G. Copeland; Busy Bee; Joe Swallows; D.F. Pangle; George Howard; Fred Fleming; Tildon Gore; Delcie Heckathorne; Mary Cullom; and M. J. Qualls. Professor J.C. Taylor, Principal of Livingston Academy, was given a special thanks for letting the fair have the building for their show, and appreciation was also extended to Professor Evie Tucker and the Livingston Board of Education for letting the fair be held in part of the grammar school building. I have no idea where the fair grounds was located in 1940, but the above information indicates that wherever it was, there was not enough room to hold the entire fair. I recently received information that the reason Fair Street here in Livingston has that name is because that area was once the location of the Overton County Fair. If there is anyone who knows if this is correct, or has additional information to share, I would certainly appreciate getting that information. When I was growing up, the fair grounds was located where the foam plant is now on East Cedar Street. Some of the carnival rides and nearly all the side shows had what was referred to as gypsies running them. They were always dark and very mysterious appearing to me and spoke with very unusual accents. It was always fun to be in church in the little First Baptist building that stood where our present library is now on Mofield Street when the carnival came to town. Because homes or buildings did not have air conditioning in those days, the windows of the church were always wide open in the summer months. The carnival always arrived in town on Sunday morning, right in the middle of preaching, and without fail, part of their caravan would have trouble making the turn from Mofield Street onto Windle Street. All the kids around my age couldn't resist trying to hang out the windows to watch what was going on, but the fun didn't last long. Clarence Stewart who was the minister then didn't hesitate to call us down with his favorite phrase "Are You Listening!" At that point, we had to meekly turn around and at least play like our attention was focused on his sermon. We didn't dare try and steal a second glance in the direction of the carnival after Bro. Stewart called us down the first time. I counted five names, (four businesses and one organization) that still exist today who contributed to the fair in 1940. Many names of people and businesses I recognized, but there were many more I did not know. Time has a way of changing things, sometimes for the better, but it's always good to see a name from the past that's still around and is still familiar. It’s also nice that distinguished women as I prefer to call them no longer have to tell their age to enter an item at the fair either.